On Wednesday AppleInsider outlined the early completion of an initial structure built on the site of Apple's Reno Technology Park project. That small facility is the proverbial tip of the iceberg. 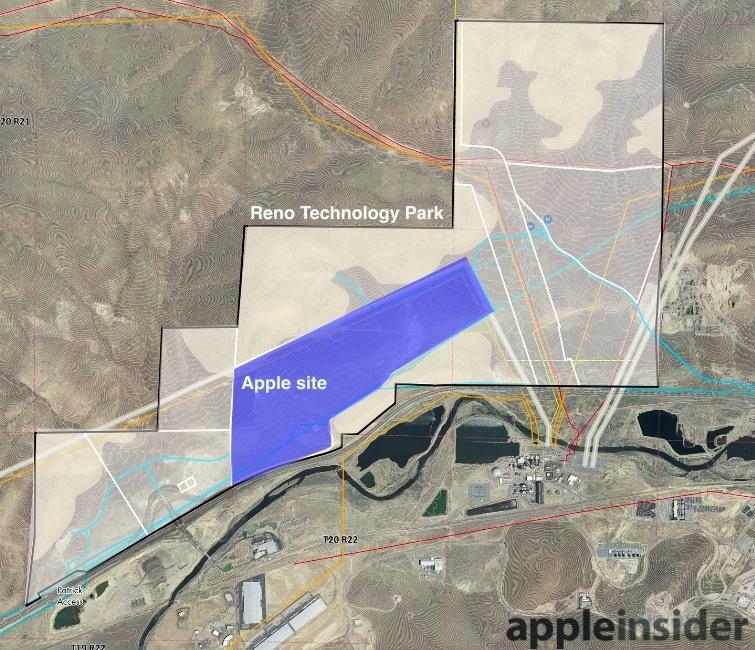 Apple has reserved a central section of 345 acres (outlined in blue, above) within the 2,200-acre Reno Technology Park (highlighted in white) to build a vast new data center now under construction. It will be the third Apple has built itself and the fourth that the company operates in the US. For comparison, the company's Cupertino, Calif., corporate headquarters at Infinite Loop sits on just 32 acres, and the new "spaceship" Apple Campus 2 will be built on 175 acres, roughly half of the size of the company's recently acquired Nevada parcel. The first data center Apple built, in Maiden, N.C., sits on 183 acres (Apple has also purchased an additional 70 acres next to it), and the Prineville site sits on 160 acres. This means Apple has already allocated enough land in Nevada to double its developed (or under development) data center acreage. Apple's total acreage reserved for known data centers in the U.S. (758 acres) is nearly the size of New York City's Central Park (800 acres), about three quarters the size of San Francisco's Golden Gate Park (at just over 1000 acres) and nearly seven times the area of the Vatican (110 acres). Of course, the locations Apple chose for its data centers are all far more appropriate locations for the massive buildings full of servers and vast arrays of solar panels (which currently cover about half of the original Maiden site). 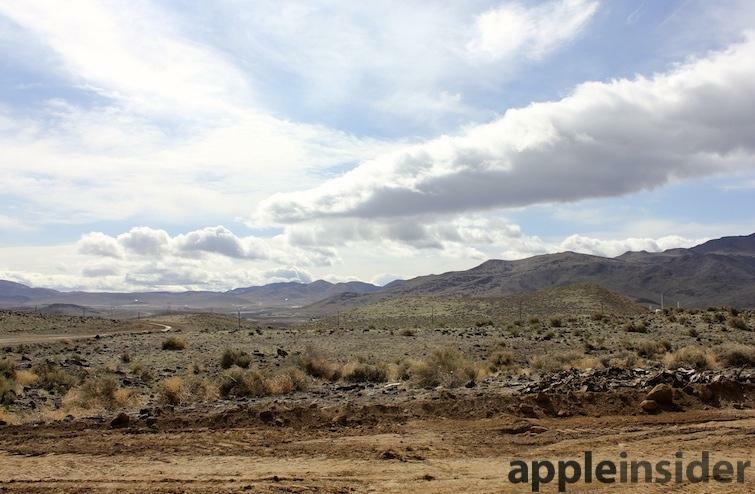 Prior to being planned out as the Reno Technology Park just a few years ago, the land Apple is now using in Nevada was primarily used to "pound sand", as the area is covered with sediment dirt that's useful in construction. On top of the sand there's a littering of black chunks of volcanic rock (below). There's no nearby volcanoes, however. 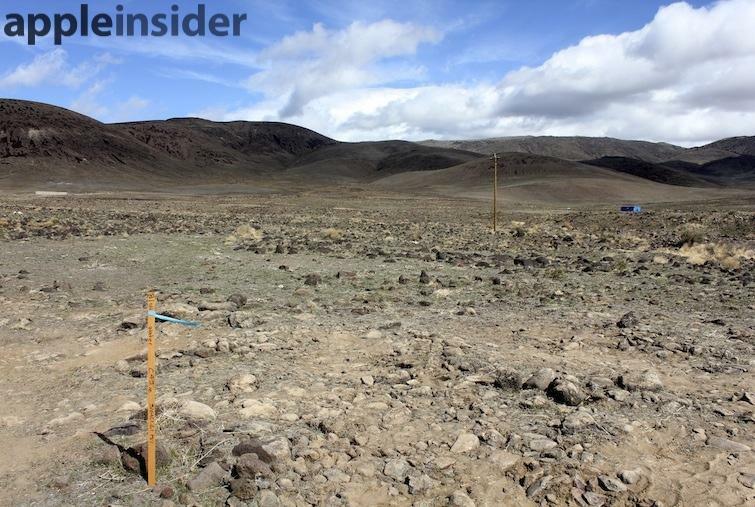 All that rock was carried hundreds of miles to the site by glaciers, resulting in a stark desert landscape that supports little more than the patches of grass and brush that can survive under the hot dry summers and cold winters of the arid climate. South of the new tech park is the existing 107,000-acre Tahoe Reno Industrial Center, which hosts a variety of manufacturing and power generation facilities and serves a logistics hub for the Western US, including shipping centers for PetSmart, Toys-R-Us and Walmart. The site bills itself as "the largest industrial center in the world." One main attraction to the area is that nothing goes on there: It's rated by the Department of Homeland Security as within America's largest "Safety Zone," given that it is "minimally seismically active," experiences little threat from tsunamis, hurricanes, tornadoes, floods, or ice storms, and is located far away from any nuclear power plants.